Today, for the first time, I made Baby Back Ribs in the Instant Pot. I must say... they turned out perfect. The spice combination is delicious and so tender you can pull the bone right out of the meat. I've been using the Instant Pot more and more lately but wanted to try putting it's meat tenderizing ability to the test which brought some Baby Back Ribs to mind. The process is quite simple really and the short amount of time required for such tender meat is another bonus. You'll be starting out in the Instant Pot and finish browning them in the oven broiler for a few minutes. Personally I think the spice rub mixture in this recipe is excellent. 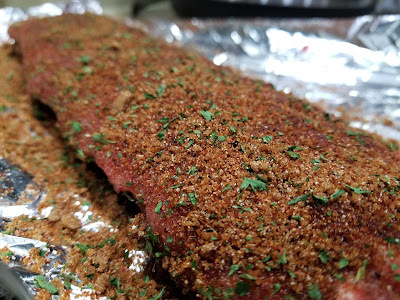 The full recipe is below but take a quick look at the video showing the basic steps of cooking the Baby Back Ribs in the Instant Pot. Be sure and remove the fatty membrane from the bottom side of the ribs. It takes a little effort to get started, try a butter knife, but once you get a piece free it peels back easily. Place the rack that came with the Instant Pot in the pressure cooker the pour in the beef broth, apple cider vinegar, and the liquid smoke. Combine all the ingredients for the spice rub in a bowl and mix thoroughly. Rub generously all over both sides of the Baby Back Ribs. Place the rack of ribs on end around the inside of the Instant Pot. Now lock the lid and close the vent. Select the Meat button and adjust the time to 25 minutes. Once the cooking has finished let the pressure naturally release for 10 minutes before doing the quick release. Remove the ribs from the pressure cooker and place on a baking sheet or broiler pan lined with aluminum foil. The ribs will be very tender at this point so use caution that they don't fall apart when transfering to the baking sheet. Brush both sides of the Baby Back Ribs with the BBQ sauce of your choice. I used honey barbeque but I'm willing to bet Hickory would be great too. My recommendation is not to put too much BBQ sauce on the ribs at this time. Now pop the ribs under the oven broiler for 5 minutes. My ribs were about 5 or 6 inches under the broiler flames. Remove from oven and let them rest for about 5 minutes. Now just cut the ribs apart and enjoy these savory and tender Baby Back Ribs with your favorite vegetable or side dish. I turn on the "Saute" setting once I add the broth ingredients to the Instant Pot (do NOT put the lid on in Saute mode). Turning on the Saute function helps get the liquids warming so the Instant Pot will build steam, pressurize, and seal quicker once the ribs are added. You could cook two racks of ribs at the same time if you'd like but I only cook one rack at a time. If you want to make each rack separately there is no need to add more broth, cider vinegar, or liquid smoke for the second rack of ribs. You will however notice the liquid level in the Instant Pot is deeper after first rack of ribs so you may need to remove some of the liquid at this point. You don't want the second rack of ribs sitting in the liquid. Copyright &copy bradgonemad.com. Simple theme. Powered by Blogger.